There are a ridiculous number of places to shop in the Orlando area. Unfortunately I can’t cover them all so I’ll tell you my two favorites in each category. Malls this one is easy my top choice is Florida Mall it’s the largest in the region and has many stores that aren’t available in other area malls such as Nordstrom’s. There is a great variety of choices from low end Sears and J.C. Penney to mid and high end retailers. A little north of Florida mall on Sand Lake Road is one of my favorite bargain stores Old Time Pottery. They offer a huge variety of household items at really low prices. You do have to hunt however. My second choice is the Mall at Millenia which is a beautiful mall with great dining options available as well. This mall is a high end mall and much smaller than Florida Mall. The area around it offers numerous additional shopping and dining options. Rack Room Shoes located to the east of the Super Target is a real find if you’re looking for shoes. Their prices are reasonable and the selection is incredible (they carry a lot of shoes in ‘wide’ for men which is great for me). Other category is outlet shopping. I’ll be honest this one was very tough to pick a favorite so it’s a tie between Prime Outlets off of International Drive and the Premium Outlets in Lake Buena Vista. They do have a lot of the same stores but they each have stores unique to Orlando. I’m not going to rate any flea markets be it tourist or local, because I refuse to shop at them, but they are covered on this site by other contributors. I hope this information is helpful in planning where to shop in Orlando. If you’re looking for a farmer’s market, be sure to check out our Farmers Market Directory. on this map indicates many shopping locations in Central Florida! Florida Mall – over 260 stores make this the largest mall in the area. Major department stores include Sears, JCPenney, Macy’s, Dillard’s, Nordstrom, and Saks Fifth Avenue. Accessories stores include Beach Hut, Crocs Store, Hat Shack, Claire’s, Louis Vuitton, SoHo, Sunglass Hut, Swatch, All-Cell Depot, Rockport, and much more! The many jewelry stores include Rolex Authorized Dealer (Mayors), Zales Jewelers, Gordon’s Jewelers, Mayor’s Jewelers, Kay Jewelers, Bellagio and more. There are many fashion stores at Florida Mall as well, including Abercrombie & Fitch, Aeropostale, Guess?, Gap, American Eagle Outfitters, Journeys, Old Navy, Zara, Players Golf, etc. Electronics stores include Apple Computer, Brookstone, Radio Shack, Game Stop, Ritz Camera, Vonage, etc. They have plenty of shoe stores as well, in case you wear yours out walking around. These include Champs Sports, Kids and Lady Foot Locker, Florsheim Shoes, PUMA, Payless ShoeSource, Tilly’s, and more. Specialty shops include Things Remembered, Hot Topic, Unique Image, Yankee Candle, etc. When you get hungry, there are plenty of restaurants. Fast Food restaurants include Five Guys Famous Burgers and Fries, Nature’s Table, Starbucks, Taco Bell and more. You can also have a sit-down meal at Buca di Beppo, California Pizza Kitchen, Crickets Bar & Grill, and Ruby Tuesday. 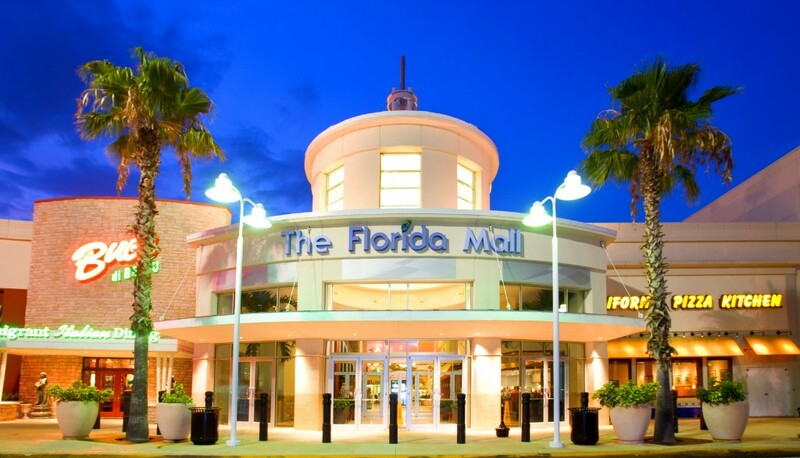 You are sure to find everything you need here at Florida Mall. The Mall at Millenia – This upscale mall is not only a beautiful place to shop, but they offer other services as well including valet parking, a U.S. Post Office, Currency Exchange International, and a full-service concierge to assist you with a variety of amenities. Included in the over 150 stores is a great selection of International and high-end stores. Major department stores include Bloomingdale’s, Macy’s, and Neiman Marcus. You can also find Burberry, abercrombie, Juicy Couture, Gymboree, Zara, Cartier, Gucci, L’Occitane, Regis Signature Salon, The Body Shop, Edward Beiner, and much more! Jewelry stores include Mayors Jewelers, Cartier, Na Hoku, Swarovski, Tiffany & Co., TOUS, and Pandora. The many shoe stores include Vans, Talbots, Marmi Shoes, Louis Vuitton, Journeys, Nine West, Aerosoles, Ed Hardy, BCBG Max Azria, and more. The Food Court includes Firehouse Subs, Gourmet Grill, Teriyaki Experience, Greek Jalapeno, and more. Restaurants include Blue Martini, McCormick & Schmick’s, The Cheesecake Factory, Brio Tuscan Grille, California Pizza Kitchen, and more. For beautiful décor, dramatic architecture, world-class shopping, and excellent service, you can’t go wrong with Mall at Millenia. Orlando Premium Outlets – (Vineland Drive location) This shopping outlet consist of 150 brand-name outlet stores. They have designer fashion stores such as Tommy Hilfiger, Giorgio Armani, Lacoste, Polo Ralph Lauren, Ann Taylor, Burberry, J. Crew, Hurley, Talbots, and more. Shoe stores include Puma, Crocs, Skechers, Nike Factory Store, Adidas, Converse, Rockport and more. Jewelry/Accessory stores include Zales Outlet, Swarovski, Cole Haan, Coach, Lids, Claire’s Accessories, and many more. They also have many other stores including children’s clothing, fine leather and luggage, gift and specialty items, and several places to grab a bite to eat. Orlando Premium Outlets is not far from the area attractions, and there are several ways to get there if you are not driving. There is a complimentary shuttle service from select Buena Vista hotels; a daily I-Ride Trolley shuttle from all International Drive hotels; bus service, or you could take a taxi or limousine. Lake Buena Vista Factory Stores – Close to the Disney resorts, they feature premium outlet stores such as Eddie Bauer Outlet, Izod, Aeropostale, Converse Shoes, Tommy Hilfiger, Toys R Us Express, Nine West, Perfume Outlet, OshKosh, Reebok, Old Navy, and much more. They even have the Character Outlet, featuring discounted Disney merchandise. There is a free shopping shuttle from 56 participating hotels. Orlando Premium Outlets – (International Drive location, Formerly Prime Outlets) With over 180 outlet stores, you will find impressive savings at such name-brand stores as Last Call by Neiman Marcus, Saks Fifth Avenue Off 5th, Victoria’s Secret, Lacoste, J.Crew, Michael Kors, DKNY Jeans, Dressbarn, Ed Hardy, Izod, Juicy Couture, Guess Factory Store, Wet Seal, and more. Shoe stores include Vans, Journeys, Foot Locker, Adidas, Nike Factory Store, Rack Room Shoes, Ugg Australia, Converse, and more. They also feature children’s stores such as Carter’s, the Children’s Place Outlet, Gymboree Outlet, NauticaKids, and more. You will also find several house wares and home furnishing stores, gifts and specialty items, jewelry and accessories, as well as several places to eat. You can take the I-Ride Trolley to stop #1 or the LYNX bus route 42 to get there. Check out the individual websites for a full listing of stores, hours, transportation options, specials, and events.